The balance of being the “perfect” teacher to your classroom(s) of kids and a “perfect” mom to your own children can be a tricky one. It can be overwhelming and guilt-inducing when your work life takes over your quality time with your kids at home. 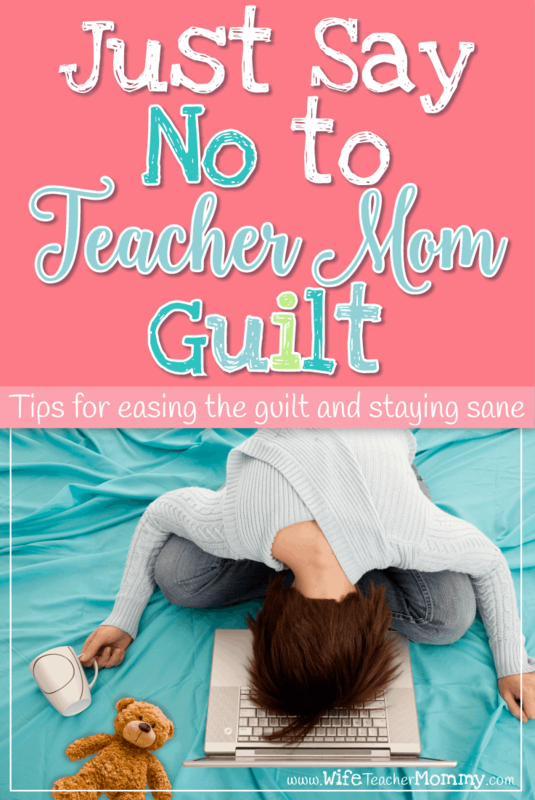 You can survive when you just say no to teacher mom guilt. It may be easier said than done, but here are some tips for easing the guilt and staying sane. There is no such thing as a perfect mom or a perfect teacher. Everyone makes mistake, and in all reality, balance doesn’t really exist. There are going to be times that you have a lot going on at school, and something will have to give at home. There will be other times that your family has celebrations, illnesses, or just needs to be together, and you need to call a sub or ask for some help. Just do it! Don’t grade everything, but if you do. . .
involve your kids in the objective grading. If your kids are old enough, let them help you grade papers that don’t require a lot of subjectivity. 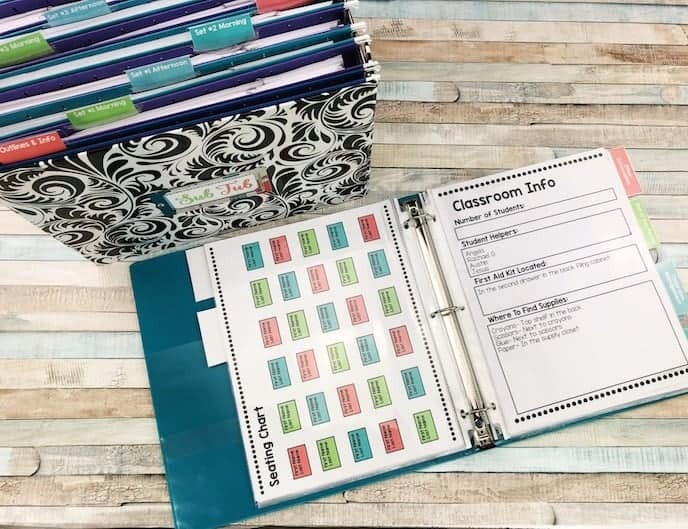 Have them check in requirements or make sure students are showing work. Make it a family event by sitting down together at the table and having a healthy snack. Just don’t spill hummus on the assignments! Involve your own children in school activities. 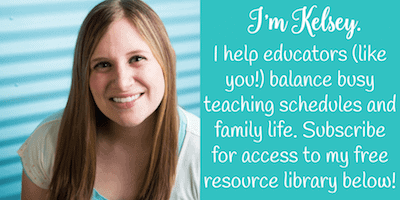 Your students may ask you to come to games, choir and band concerts, or other special events. Although you can’t go to all of them, choose some that your own kids will enjoy. If your school has a talent show or a musical, bring your own kids for some fun, family-friendly entertainment. Do your children at home love sports? Bring them to a student basketball game. 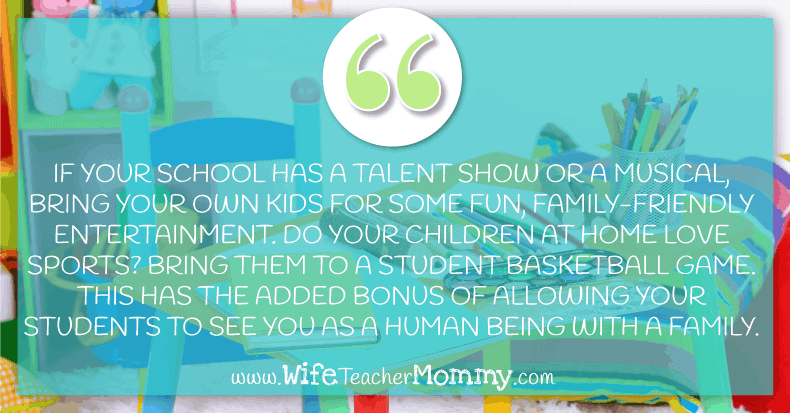 This has the added bonus of allowing your students to see you as a human being with a family. Relationships are so important, and being there for your classroom kids and your own kids goes a long way! Let computers do the grading. Better yet, for objective assignments, use Google Forms, GoFormative, or other tools to make assignments you can autograde with a touch of a button. This will save you hours at school and help you avoid taking so much work home so you can focus on your family. 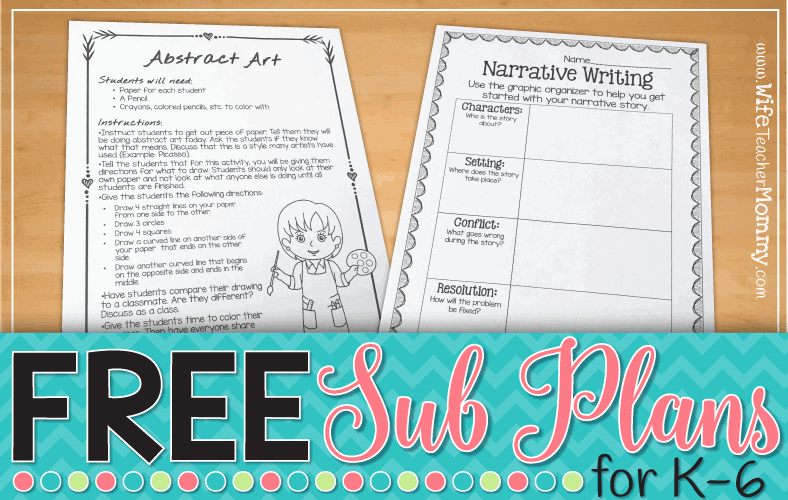 You can find tons of pre-prepared units and worksheets in my shop and all over the internet. Why do all the work when someone else has already done it? 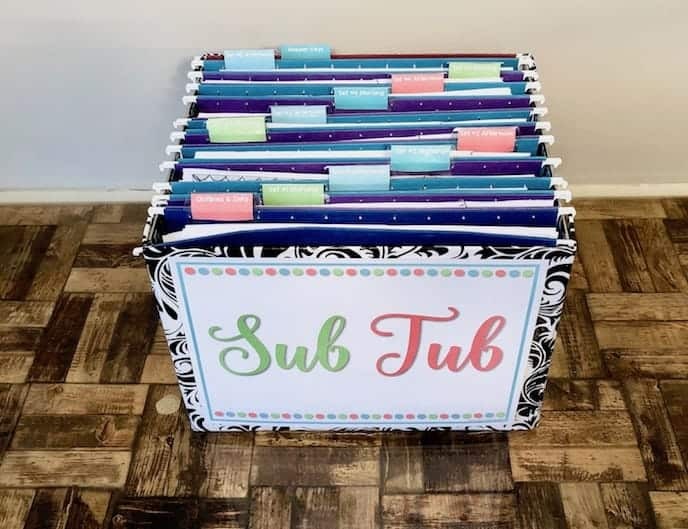 For those days where you just need to be mom, print off some free sub plans, and spend some bonding time with your own kids. 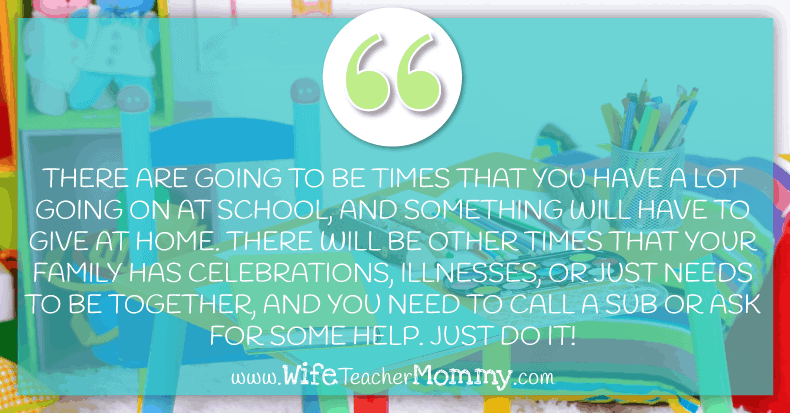 Don’t wait until one is sick or you have a family emergency to give yourself permission to volunteer at their school, take a day trip together, or just spend some time hanging out together at home. 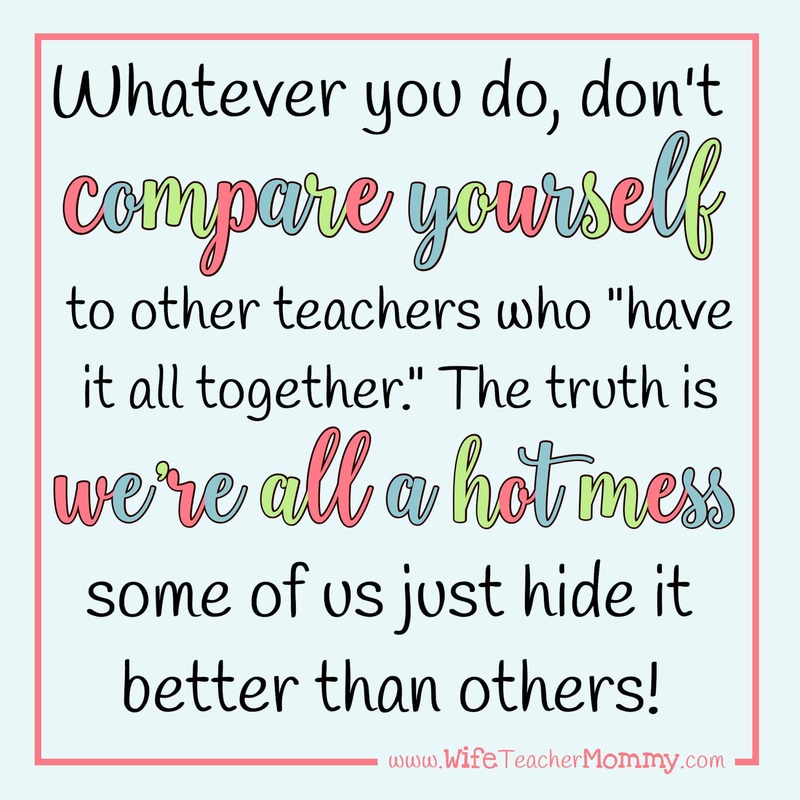 Don’t compare yourself to other teachers. This is one of the biggest mistakes teachers make! We usually compare the best version of others to the worst version of ourselves. This isn’t fair, and it isn’t realistic. Just do the best you can do at being a great teacher and a mom, while giving yourself grace. Remember, you can do anything, but you CAN’T do everything! …EVEN WHEN there’s still work to do! Because the fact of the matter is, when you’re a teacher, there’s always more work that can be done. 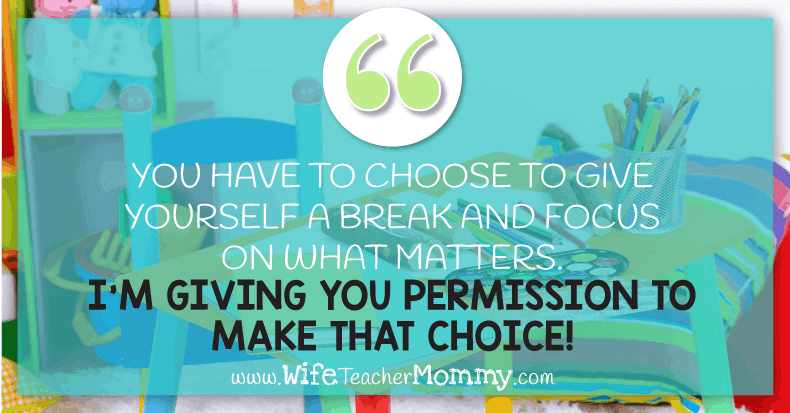 You have to choose to give yourself a break and focus on what matters. I’m giving you permission to make that choice! Taking time with your family AND time for yourself are both important for your mental health. This will help you be a better teacher AND a better mother. These tips for easing the guilt and staying sane will help you reduce or leave some of your workload at school as well as integrate your family into your school life. Just remember, you’re doing the best you can, and you’re a fantastic mom and teacher.